Use of various violin instruction tools, including metronome, tablature, fingerboard tape, etc. Michael attended Fresno State University and, along with teaching privately, has played the violin for over 47 years. He has toured nationwide and internationally, and he has recorded more than 10 albums with the Celtic rock band Tempest. 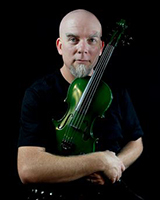 He has taught violin and fiddle workshops, examining specific points of technique or elements of style. Experienced in working with young children through adults at all levels (beginning through advanced). He has prepped young musicians for college entry into various institutions, including the Berklee School of Music in Boston, The Royal Academy of Music in Edinburgh, Scotland, and others.